Posted 12/9/2009 10:38pm by Catskill Merino. Dominique sits in the bucket of the tractor holding a ewe who was found cast, meaning she was over on her side; down in the slush, she couldn't right herself being in full fleece. A wooled sheep on a slope with its back lower than its legs, can not get its feet on the ground to get up; even the slightest inclines like those around woodchuck holes in the Summer cause problems. 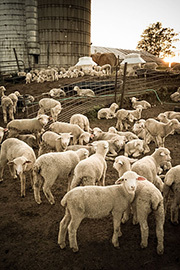 A down sheep will die in several hours; its rumen begins to malfunction and that affects other internal organs and processes. When you stand a cast sheep up, it lists and circles to the same side it was down on and falls; you continue to stand it up until it can remain standing on its own. 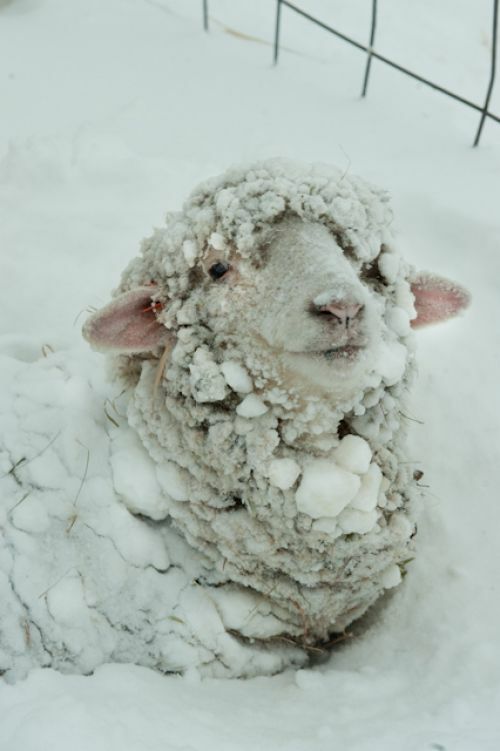 This ewe was wet and cold. She had been down in the slush for some time and she couldn't stand for long; she was shivering so we gave her a ride up the hill to the barn and offered her dry hay with some oats (she was hungry which is a good sign) to warm her up. Later, she was able to stand and will rejoin the flock tomorrow. A shepherd must keep looking at her flock.